Thank you to all contributors for this. I would however comment that I feel the final few minutes presented by Chris Hicks are in my opinion the most useful for most Emergency Medicine physicians. While Dr Inaba gave a comprehensive review, I think it it very unlikely that outside of a Level 1 trauma center where this procedure is being performed commonly, it is highly unlikely that a sole EM physician (or 2 of them if double coverage) would be able to efficiently cover all of the steps he went through. Agree with Dr Hicks that the goals for this should be crystal clear before you start, and that the main salvageable injury would be release of pericardial tamponade, and hemostasis of any penetrating cardiac wound. Stopping after that in the non-level 1 center would be quite reasonable. I also feel that the traditional US approach of left lateral thoractomy is perhaps not best suited to EM physicians, and I personally think the UK and Australian HEMS approach to clamshell from the outset makes the most sense. This is also recommended by Dr G Davies of the London Trauma Center (ref: "Emergency Thoracotomy: "how to do it". Emerg Med J 2005;22:22-24), and the late Dr John Hinds (ref SMACC lecture 2014). To summarize these recommendations, intubate, and perform a left and right finger thoracostomy to decompress both sides of the chest. If this achieves ROSC from release of tension then great. If not then make an incision that joins the two together and perform a clamshell thoractomy. Yes it is a dramatic incision. 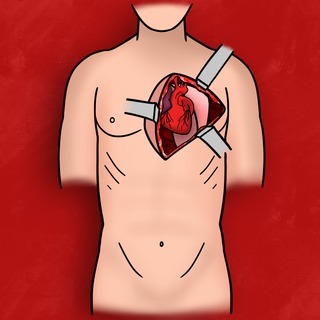 But if you have not done a thoracotomy in 10 years, then I feel this gives the non-surgeon the best visualization of the anatomy, and the best exposure to the pericardium. In essence, you get one chance at this to get it right, and so optimize your chances with a good view. I would be very interested in others thoughts on this. I totally agree. Especially if singled covered. I can't be on both sides of the patient at the same time. I can complete the clamshell from the left side of the patient where I am standing. Noticed did not comment on the use of pledgets during repair- is this still recommended? I assume theyre using crash cart epi for the intra-cardiac injection? About how much? Mallory, what a great question...unfortunately, there is no solid pre-clinical animal or clinical human data to support what drugs we should be using or how much in these patients undergoing open cardiac resuscitation for traumatic arrest. Practically, despite the lack of evidence we do use direct intra-cardiac injection of drugs such as Epinephrine, Vasopressin and Sodium Bicarbonate into the Left Ventricle. For Epinephrine, in the resuscitation bay at LA County, our pharmacist prepares syringes with 1mg boluses for us to use. In the OR we use pre-filled Epinephrine syringes. Using a fine, 22-23G needle helps to prevent needle hole bleeding. how long is the needle? how much sodium bicarb into heart? or is it peripheral? is the epi every 5min? how do you time it all? is intracardiac epic standard across other centers? or do some do peripheral instead? ever use calcium? Hi Donald, really great questions. In the setting of traumatic arrest, we are focusing all of our efforts on restarting the heart with enough organized cardiac movement to perfuse the coronaries and brain. At this point, we want the epinephrine, and whatever else we inject, to enter into the coronaries and impact the heart. This is why we inject the medications directly into the heart rather than using peripherally infused medications which likely will not circulate appreciably. The ideal choice of medications is unknown. Specifically in response to your question about bicarbonate and calicum, in a prospective study (World J Surg, 2012: 36(8): 1772-8, https://www.ncbi.nlm.nih.gov/pubmed/22488327) we sampled intra-cardiac blood from patients in traumatic arrest undergoing resuscitative thoracotomy and found that severe lactic acidosis was associated with a decreased probability of cardiac function returning. Calcium levels however did not differ between those who did and did not have return of cardiac function. Consequently we do use bicarb but do not use calcium. We use standard 50meq ampules of sodium bicarbonate and 1mg doses of epinephrine. The optimal dosing of these medications is also unknown and in practice is titrated to a clinical effect, in this case a beating heart. As far as the needle is concerned, although the ventricular wall thickness will vary depending on your patient, all standard needles should easily traverse the myocardium. Choosing the needle gauge is a balance, as injecting the bicarbonate can be very tedious through a fine needle. We use a 16-18G needle, and any needle hole bleeding can be repaired should the patient survive.